Do you believe in magic? 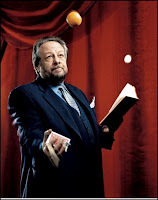 Ricky Jay is one of the most-revered (some say the all-time greatest) card magicians in the world. I was in rapture when I saw perform in "On the Stem", his show of card tricks and stories of the days when Broadway was a dodgy, exotic, character-laden neighbourhood. In astute performances in the HBO series Deadwood and films including The Spanish Prisoner and Magnolia, he plays the world-worn character who always has something up his sleeve. Jay has a consulting business advising writers and producers on magic effects, and is an historian and writer of magic; his books include "Learned Pigs and Fireproof Women", a history of oddities and acts. Another bit of magic is Jay's physical presence. He could walk right by you on the street, as nondescript as your uncle Max, the accountant. But on stage or screen the word is mesmerizing, a word that refers to an 18th century Viennese physician who hypnotized his patients. For a look at Ricky Jay doing what he does best in the world, here's the master at work showing us "Four Queens Three Ways". I thought he was fabulous in Deadwood, but wasn't aware he was a magician. Wow! One of the top several in the world! Like Deja, I had seen him on Deadwood and in Magnolia but I had no idea that he was a magician. Speaking of which, why did they cancel Deadwood??? I loved that show. Belette- Why? As Al Swearingen would say, "F---ing imponderables." The production costs were immense- they planned to make two TV movies to conclude the story but costs were too high. Wow, how did he do that? Industry gossip is that David Milch (writer/producer) wanted to take a break from Deadwood to do John From Cincinatti and then come back and do the movies. But then JfromC was so weird and bombed so badly that HBO was fed up with him and cancelled the movie project. Deja: John from Cincinatti was BAD! What was he thinking??? I'm gonna have to UdeMan Ian McShane now! Yum. Deja- No fair,what happens? I loved Trixie so much. CAVF- Ricky Jay is astonishing, check his other You Tube videos for more jaw-dropping card handling. Have you ever been to the Magic Castle in LA? So, heh heh, I am NOT the only one who finds Ricky Jay a stud muffin? He can shuffle my deck any time.